The chain for this bracelet is ideal for charm bracelets because it comes filled with jump rings. This cuts down on the work necessary to attach the charms and beads. It also gives you a fuller looking bracelet with a minimal number of additions. I've included my own short cut for attaching the briolette beads which will save you steps in making the usual briolette wrap wire. step 1 - Lay out the chain and plan the placement of your pieces before attaching anything. The size of your wrist will determine how long the chain needs to be, and therefore the spacing of the beads and charms. 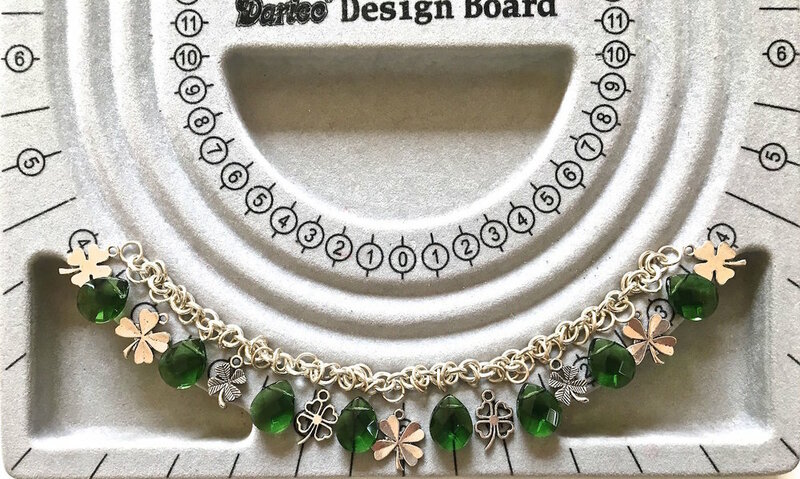 My chain measures 6.50” long without the clasp and contains 11 beads and 11 charms. step 2 - Start your placement with a charm in the center of a bead board if you have one. From there work out to one side of the chain alternating beads and charms. Once you know how many pieces are required to complete one side of the chain, you can duplicate it on the other. step 3 - Using flat nose and needle nose pliers, open every other jump ring and attach a charm. Alternate between the different shape leaves. step 4 - Cut 11 pieces of 26 gauge wire to measure 3" long. Grip the end of a wire at .75" with needle nose pliers. step 5 - With your fingers, turn the wire over the top of the pliers. step 6 - Slip the wire into the bead only until the short end of the wire is halfway into the bead hole. step 7 - Press the looped wire against the side of the bead. Use flat nose pliers to create a slight bend away from the bead in the looped wire. step 8 - Press the long wire up against the opposite side of the bead. step 9 - Grab the looped wire with flat nose pliers. Bring the long wire around the base of the loop and wrap it four around four times. step 10 - Cut off the excess wire. With needle nose pliers, smooth the cut end of the wire to blend into the wrap. Create 11 wrapped beads this way. step 11 - Open the chain links between the charms and attach the beads. step 12 - Attach a lobster clasp to a link on one end of the bracelet and an 8mm jump ring on the other end.